SALT LAKE CITY – Though they all seem to get lumped together as happy Cinderellas, there are subtle degrees of underdog baked into March Madness. But Geno Crandall went full-on ’dog his first time around the bracket. How full? He and his North Dakota teammates were nearly stripped of the thrill of seeing their name go up on the board on the televised NCAA Selection Show – even though they were guaranteed a spot in the field. At the time, they were taxiing down an airport runway where even the CBS eyeball dared not tread and thus were out of sight, out of mind. So when Gonzaga’s graduate transfer guard got to be part of the royal treatment when the Bulldogs basked in their No. 1 seed with a CBS camera eyeballing them Sunday, he made sure to soak in the whole experience. But he did that the first time around, too. The madness of the NCAA Tournament is especially pronounced at the extremes, at least that first day. There is the white-hot light focused on the No. 1s like Gonzaga, and there is the carefree delirium that washes over the first-time schools and outpost conference long shots. Geno Crandall has lived both. “It’s crazy how different it is,” he said. Only Coach Mark Few among the current Bulldogs can say the same, having been an assistant on GU’s breakthrough team of 1995, when the Zags showed up in Salt Lake as a No. 14 seed – assigned to a motel where the room doors opened onto the parking lot. Crandall’s underdog baptism came in 2017, when North Dakota crashed the bracket for the first time in the school’s short Division I history. Five years into their brief stay in the Big Sky Conference, the Fighting Hawks won the regular-season title but had to storm back from 11 points down in the conference title game in Reno, Nevada, to beat Weber State – Crandall sending the game into overtime with a driving layup. But a weather delay in Minneapolis pushed a connecting flight home to Grand Forks back to about a 3 p.m. takeoff on Sunday – when the Selection Show goes on the air. When the plane finally was cleared for takeoff, Greg Gumbel was just plunging into the West Region. Then came the on-board announcement that electronic devices would need to go offline. The passengers – UND players and more than a few fans – booed the captain. And celebrate it – even wedged into narrow airplane seats. History is a funny thing. The Hawks were assigned a No. 15 seed and sent off to play No. 2 Arizona in Salt Lake City – the same pod in which the 2017 Zags launched their run to the Final Four as a No. 1 seed. Josh Perkins, Killian Tillie, Rui Hachimura, Jeremy Jones – Crandall’s teammates now after his fall transfer – maybe got a nod in a hallway then. “Looking back from where I am now, that was probably the strangest thing all that week,” Crandall said. Otherwise, it was straight underdog stuff. Crandall and his teammates knew then how they were supposed feel and act. The Hawks gave Arizona their best shot – they were down seven with an open 3-pointer late before the Wildcats pulled away to win 100-82. 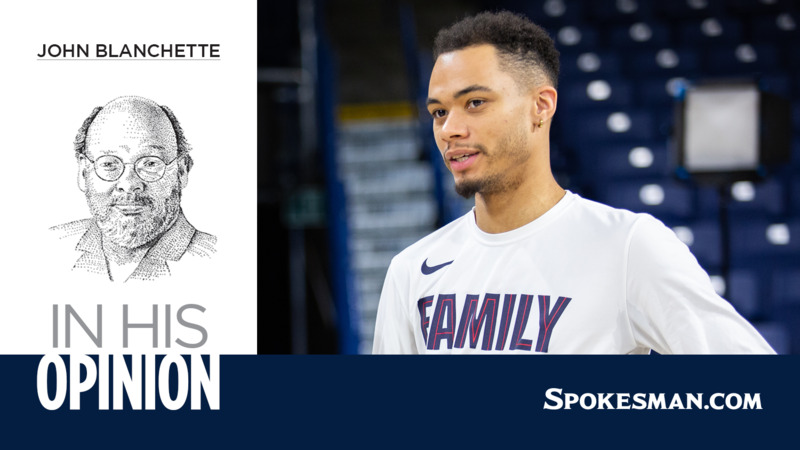 Earlier that day, the Zags went through a similar favorite’s tension before shedding South Dakota State, a 16-seed trying to make history – the kind of fight GU can expect from Thursday’s foe, Fairleigh Dickinson. But even if they’ve been there, Crandall will remind the Bulldogs what’s coming. Maybe especially in the wake of the West Coast Conference tournament pratfall against Saint Mary’s – which hasn’t seemed to dampen GU’s appetite a bit. Published: March 19, 2019, 6:49 p.m. Updated: March 19, 2019, 10:17 p.m.